Mr Ako Tetteh, Public Relations Officer of the National Theatre on Wednesday, appealed to multi-national companies and civil society organisations to financially support the institution to enable it to perform its core mandate. According to Mr Tetteh, investment in the theatre would serve as a stimulant for the organisation of eventful programmes, especially educative ones for both students and the public. 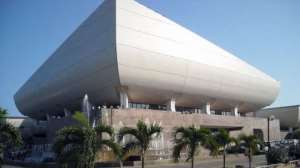 He added that the theatre has enough expertise and staffs to organize programmes frequently but is unable to do so due to the financial challenges it was grappling with. Mr Tetteh made the appeal during a ‘Theatre Programme for Schools (TPS)’ organized by the National Theatre as part of its activities to mark the 2019 World Theatre Day. The programme which attracted over 50 Basic and Junior High Schools from the capital was aimed at providing better literature education through play. A resident group performed the play “Dilemma of a Ghost,” which is a text book for Junior High Schools. “We have taken advantage of the World Theatre Day to educate the children about the play so that they will be better informed before they sit for their final examinations”, he said. He added that it was also an opportunity for the theatre to promote the performing arts as a mandate. Mr. Tetteh, explained that the theatre had intentions of organizing such programmes annually which would also target pupils in the public schools. Mr. Sparkles Ankrah, an English Literature teacher at Lydians International School said he was grateful to the institution for providing both teachers and pupils a practical experience of what they had taught and leant theoretically. “I think this serves as a platform for practicalities. It’s just like what the science students do at the laboratory, so it’s good to experience it after having the theoretical aspect,” he said. He said it was his hope that it would be an annual activity in order to help subsequent pupils and teachers to make their jobs in the classroom much easier. Miss Valerie Wontumi, a pupil of Sunrise International School said watching the play had given a better understanding of the book inside out; “am ready to answer any question on the topic. “The play has helped me to understand what the writer was trying to put across in the book. I am therefore certain that even without additional reading I will be able to answer any question that comes in the final examination and I am also confident that I will be able to explain vividly to some of my colleagues who didn’t have the opportunity to watch this play,” Miss Wontumi stated.